Dry, rocky and almost without vegetation, Malta was initially very hard to swallow! The tenacity and the spirit of sacrifice of the new owners was really put to the test. The natural resources were modest and the conditions of defence were mediocre. The first impressions report that the Hospitallers found their new land disheartening, but during the two centuries spent in Rhodes they had acquired a maritime mentality and their long experience did not fail to offer solutions to the numerous problems. The only positive element was the condition of the coast: two very large and deep inlets could host numerous ships of notable tonnage and size. The two ports could be used immediately to offer more than adequate refuge for the fleet, allowing also to manoeuvre with ease. The problem regarding the installation of the war fleet was a decisive factor especially if we consider that the defence of the island was initially to be entrusted to the fleet in case of attack, as the fortifications on the island did not constitute any sort of obstacle. The ventures undertaken in the following years were numerous. It was a period during which the Order seemed to be acquiring a deeper and deeper conscience of the role it was called to carry out. The military actions of its Captains would make history richer, not only for the importance of the single episodes but because they would bear witness to how constant was the commitment of all the Order's members in performing their institutional tasks. From the first months of their stay they worked incessantly and even though, from a strategic point of view, the island had a position of great value, however much effort they exerted they could not fortify it completely. The amazing thing was that the Turks had not already utilised it themselves as a stronghold and the only possible answer to such a consideration was in the total conviction of the Crescent not to have any rivals in the Mediterranean. It would therefore have been useless for them to start such a complex and expensive undertaking as the one the Knights were beginning. On July 21st 1547, while the ships were engaged on a mission, the corsair Dragut, one of the cleverest and most dangerous Turkish Captains, was so bold as to land on the island with a group of soldiers and capture three hundred of its inhabitants. It is difficult to establish whether this was an act of courage or a demonstrative action. The venture of Dragut showed, however, that Islam, even though engaged in the conquest of Eastern Europe, continued to consider itself master of the Mediterranean and warned its eternal enemies that it would soon be putting the Knights on their mettle. Suleiman and his Admirals made it quite clear that they also had plans to conquer Italy. In 1550 Massa and Sorrento were sacked and many times during the following years Muslim ships sailed up the Tiber, pushing themselves as far as the doors of Rome. In the first months of 1564 news came from Constantinople that Suleiman intended to launch his armies on a new and huge undertaking. The old Sultan was the ruler of an immense empire but he still had one ambition to realise: the conquest of Rome, the capital of Christianity. A dream that he dared not to confess to himself but that had been obsessing him for a long time. Between the Red Apple, as the Turks called Rome, and his scimitar, there was only the island of the Knights: a stronghold from where they could launch their ships on speedy and deadly missions. An army, whose objective was Italy, could not tolerate having such a military base behind its back without running the risk of seeing its supplies cut off. Malta was a fortress to be conquered and this was an occasion to eliminate the Hospitaller Knights forever. The Christian powers were unable to reach an agreement, eternally divided as they were by interests and jealousies of various kinds. They did not heed the warnings of Pope Pius IV who expressed his concern for the imminent danger many times and with energy. The organisational effort that the Turkish Empire was facing was exceptional and showed that Constantinople was preparing for a long and difficult war. In many parts of the Empire massive recruitment of men was carried out and the number of ships being prepared was impressive. The hypothesis of some observers who held that Malta was an unlikely goal and that the real objective of the Muslim army was Italy, appeared quite plausible. Whatever might have been the immediate intentions of Suleiman, what was certain was that after the fall of the Island of St. John he would turn his eyes to the Italian peninsula. The appeals from the Pope were unheard. In the Consistory held on February 23rd 1565, the Pope addressed the Ambassadors with sorrowful words, in order that they could express the gravity of the situation to their respective Sovereigns. This solemn and official exhortation did not give any result and the events precipitated. A few days later, on the morning of March 22nd, in the main dock of the Golden Horn, Suleiman the Magnificent received homage from the greatest army he had ever put together in his long career as a leader. Before embarking, thousands of men swore royalty until death and in the European capitals some finally began to realize they had underestimated the threat that came from the East. The details of the imminent attack had been known by Jean Parisot de la Vallette, the 49th Grand Master of the Order, for a long time, though the governments of the Christian powers appeared not to be concerned about the problem. Born in Toulouse in 1494, of an ancient and noble family of Provence, this brave soldier had devoted his life to the ideals of the Order of St. John and was a protagonist of some of the Order's most important events. A very experienced leader, he was considered one of the bravest Captains of his time. He was an attentive and astute politician and had continuous relations with all the European Sovereigns. He did not believe, however, that the project of an alliance among the Christian States against the common enemy, as a radical solution, could ever be possible even though it had been discussed many times. Neither did he believe that anyone would come and help him and his brethren at the moment of danger. He was only 28 years of age when he had lived the dramatic experience of the siege of Rhodes. He believed, at the time, that reinforcements would come from Europe to help the Knights engaged in a battle fought in the name of Christianity, but time passed and no sails appeared on the horizon. Day by day, he saw his brethren dying, a sight that would have a lasting effect upon him. The indifference of the West had mortified his knightly spirit and made him suspicious of promises. This was the man facing Suleiman. As he scanned the horizon from Fort St. Elmo the old Grand Master remembered the suffering and the humility, but the victories too, all in the name of the "Sacra Milizia". He knew that the battle at which he would spend all his remaining energy would be his last. This belief made him invincible. He had not had time to change Malta into an invincible fortress but he had taken all the necessary precaution to make the conquest of the island as difficult as possible. Jean Parisot de la Vallette may have had some regrets about the state of the military defence but he was satisfied with his information service. A long time in advance he had sent some Knights to Constantinople with the task of furnishing him with continuous reports about Suleiman's decision and movements. They were real secret agents and had demonstrated their worth not only by obtaining information but also by carrying out surprise attacks. On January 19th 1565 La Vallette received a dispatch informing him of an attack against the island in the following spring. The long awaited hour was arriving and he ordered the Grand Priors to mobilise all the brethren who were able to fight. He knew he would not receive help and that he had to rely only on his own people. On the morning of May 18th a cannon fired a shot from Fort St. Elmo announcing the arrival of the enemy fleet. On the walls protecting the island there were four hundred and seventy Knights, one thousand six hundred Spanish and Italian mercenaries, five thousand soldiers of the Maltese Militia, one hundred and twenty artillery men and sixty-seven assistants. On the opposite side were, five hundred ships and forty thousand men. Mustapha Pasha led the land forces while admiral Piali Pasha commanded the fleet. The two did not get on well and their disagreement resulted in various advantages for the besieged. The Turks appeared not to want to waste time. Following a few raids on various parts of the fortifications, they decided to attack St. Elmo. They had thought that with the fall of that stronghold, they would gain possession of the whole island. This was a grave strategic error on their part and they suffered heavy losses. Besides, the fall of St. Elmo would not compromise the Order's defence system as the infidels had imagined it would. From the beginning of the Siege it bad been clear that the Muslims relied heavily on their numbers and the destructive force of their artillery. The bombardment of Fort St. Elmo lasted twenty six days: a continuous rain of fire, interrupted now and then by useless and bloody attempts to scale the walls. The general assault, fixed for the morning of June 16th, went on for seven hours. Thousands of Janissaries attempted to overcome the handful of men opposing their fury but they were repelled twice by the Knights, who each time compelled them to retreat, leaving more than one thousand dead. The Knights of St. John were also at their extreme limit. More days of bombardment followed and, on June 22nd the enemy tried again. In a desperate attempt to scale the top of the walls, the Turks employed hundreds of long ladders up which they climbed, spurred on by the drum rolls and by the shouting of their leaders. The defenders, although exhausted by the heat, thirst and injuries, managed to drive back the enemy assailing them with an avalanche of stones and fire. A soldier, who had managed to swim across the harbour, informed the Grand Master "There is no more ammunition and no Knight of St. John unwounded"! June 23rd, the eve of the feast of St. John, patron of the Order, was the day a new offensive would be launched. The few remaining survivors among the Hospitallers went to confession and received Holy Communion. They knew their destiny: no one would come to their aid and it was useless to hope in the mercy of the enemy. The final battle took place at the doorway of the chapel and lasted just a few minutes. Having slaughtered the last of their adversaries, the Ottomans planted the standard of the Crescent on the ruins of the fort. The most fortified bastion on the whole island was in their hands. But at what a price! It took thirty days of fighting, eighteen thousand rounds of ammunition and the lives of seven thousand Janissaries. The loss had been heavy for the Christians too: one hundred and seven Knights and one thousand five hundred soldiers were killed. The island had yet to be conquered, however, and the heroism of the defenders of St. Elmo had roused the other soldiers of the Cross. On June 30th six hundred men, including forty four Knights, arrived from Sicily. Nothing compared with the numbers of the enemy but their arrival helped to raise the morale of the besieged. It would take too long to list the innumerable acts of heroism of the Hospitallers and Maltese during the endless months of siege. Their determination and courage contributed towards saving Christianity and western civilisation. Men coming from different nations, gave an example of how important faith, together with a common ideal, was to a divided and uncertain Europe. The Siege of Malta was not just another of the many battles fought between Muslims and Christians. The military prestige of the two sides was at stake in this decisive duel between the Cross and the Crescent. On July 15th Mustapha launched another huge attack in which he hoped that the will of his enemies could be weakened by endless bombardments. On this occasion he counted yet again on the numerical superiority of his troops. 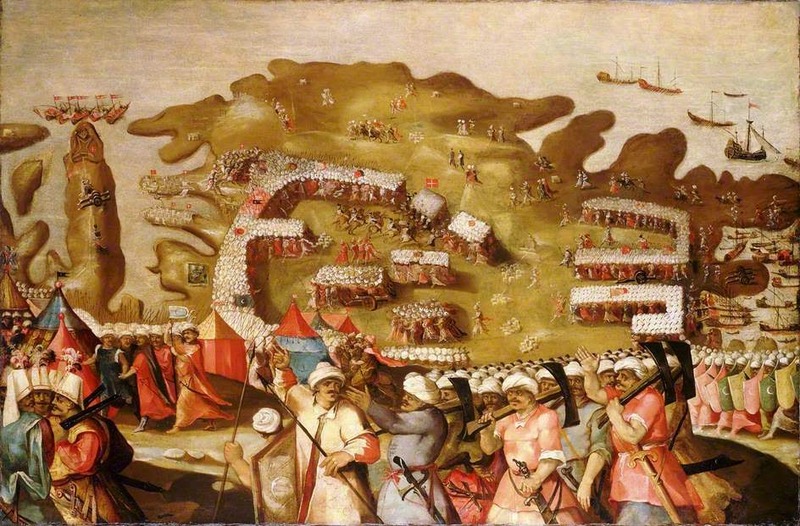 The soldiers of the "Sacra Milizia", however, managed to resist, while, day by day the Turks seemed to be losing their usual aggressiveness and their certainty to return home winners. They made other attempts to bend the besieged on August 2nd and 7th but, in spite of the losses, the Christians, supported by the words and the example of their untiring Grand Master, yet once again got the better of their enemy. Mustapha could not resign himself to losing and his men threw a hail of artillery fire against the enemy positions and the best Turkish foot soldiers were massacred, but all in vain. Furious and desperate, the Commander of the Ottoman army played his last card. His people were already demoralised and exhausted and when news of an imminent arrival of reinforcements for the besieged arrived from Sicily, the weather happened to change for the worse. Admiral Piali realised that summer was coming to an end and that a sudden storm could surprise the fleet in a sea full of hidden rocks. On August 23rd and 30th the last attempts to conquer the heart of that island, on whose beaches Mustapha was sure to conclude his career as a triumphant Commander, were made but every effort was in vain. His army embarked, humiliated and disheartened, and the Commanders gave the order to set sail towards Constantinople where the anger and revenge of the Sultan awaited them.